Daily we have a free city tour and free maps for you. Brasov is of course known for the beautiful picturesque medieval old town, the black church and the citadel but there is a lot more to see. Wander around and get lost in the city to discover houses from centuries ago to huge soviet buildings to really modern architecture. The thing is that only seeing the Old Town doesn’t do this beautiful city justice. 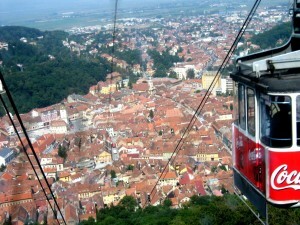 Climb up on Tampa, have an overview of the city near the Brasov sign and feel the mountain air. Brasov, being in the middle of Romania, is also a brilliant check-point to start travels from so it is recommended to discover what’s outside the city borders. Visit the nearby Bran village or Sibiu with beautiful castles; take on a longer trip – the rain connection is excellent. After visiting museums and galleries, try to have some outdoor fun and go for a hike in the mountains, it will be rewarding. The Council Square The unquestionable treasure of Brasov is the Council Square in the heart of the old town. Built in the 13th century, once used as a meeting place for councilors is now used as a nice stop in the old town for picturesque scenery with views to colorful architecture and beautiful baroque ornaments. The Council Square boasts the Town Hall built in the beginning of the 15th century making the square one of the finest in the country. At the top of the Town Hall building you will find the Trumpeter’s Tower once used as a watchtower. 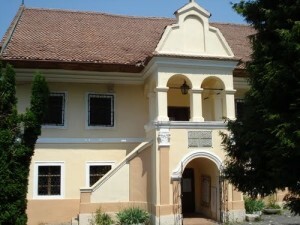 Inside the building is the tourist information and Brasov History Museum. Special tip: Be sure to discover the close-by old town in more detail – the Brasov Guided Free City Tour is brilliant for that! The Black Church The famous gothic church that was built for almost a hundred years from 1385 to 1477 has actually gotten it’s name due to a fire that leveled most of the town in the end of the 17th century also blackening the walls of the church. The restoration as well took roughly 100 years and only one of the planned towers was finished during that. The interior got a makeover from gothic to a mostly baroque style – beautiful high ceilings and light space with tained glass windows, balconies.Besides the stone columns and Turkish carpets donated by German merchants you can also find the huge organ from 1839 with impressive 4000 pipes you can listen to three times a week during summer. Special tip: The church also owns the largest church bell in Romania weighing roughly 7 tons. Program and prices: Summer programme (15 June – 15 September): Monday-Saturday: 10 AM – 5 PM Sunday Closed Winter programme: Monday-Saturday: 10 AM – 3:30 PM Sunday Closed Ticket: All ticket – 4 LEI Reduced ticket – 2 LEI Organ concerts are held only during the summer: June and September: Tuesday (6 PM) – 5 LEI July and August: Tuesday, Thursday, Saturday (6 PM) – 5 LEI The Fortress In 1524 a semi-circle tower was built here, and then the place was surrounded by a wall. In 1625 the 81m deep well was rebuilt in the inside yard. The square fortress, whith Italian bastions on its corners and watchtowers, has got one entrance. There used to be a drawbridge leading to it. In 1688 some of the citizens found shelter here from the Habsburg troops. In 1773 the Holy Roman emperor Josef II commenced its renovation. Nine years later he made a sales proposal to the town. The town did not accept the proposal, thus the fortress functioned as a prison for Turkish and later on for French prisoners. The forties it was renovated but remained unused for a while. Today it houses a restaurant. Special tips: The fortress offers a nice view over the city. Under the Tampa Mountain Here, you can admire the stunning geometry of the city in a natural and relaxing environment, between the walls of the old city. While you’re walking along the Sub Tampa alley you’ll notice the old city towers, each having a great story to discover. 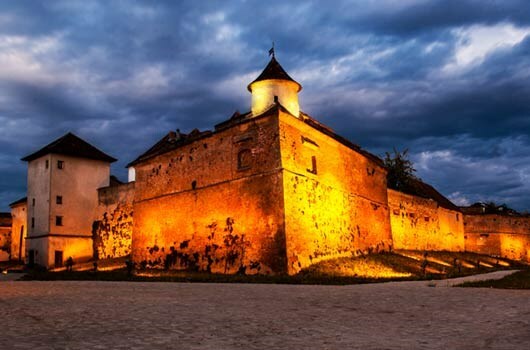 Most people who come to visit Brasov, wander around the city center and the museums, but what is more interesting, is the real history that lies behind the ancient walls of the old citadel of Kronstadt. One of the best places that offers a wide panoramic view over the city, is known as the Sub Tampa alley. Special tips: on this section of the wall here built defensive towers for protection. Some of them are open as museums nowadays! The alley is a good place for jogging. Tampa Mountain Ascend Mount Tampa by cable car (going up to an altitude of 940m) or by walking up one of the paths twisting up the hill to soak up excellent views of medieval Brasov, the incredibly flat plain to the north and of course the Carpathians. In the 1950′s, when Brasov was named Orasul Stalin (Stalin City), trees were chopped down so that the name of the great dictator appeared on the hillside facing the old town. Nature has recovered from the shock, and the hillside is now a nature reservation. From the upper cable car station walk five minutes (not 15 as indicated) along the path to the rocky outcrop (the top, 955m high) for the best views of the old town. You’ll clearly be able to make out the different parts of Brasov: the German part of town has hundreds of red roofs crammed between straight streets surrounding Piata Sfatului, while the Romanian Schei district to the south (left) is a spaghetti of small streets, jumbled houses and cemeteries, petering out towards the hills. On the plain are the later additions to Brasov: the 18th and 19th century expansions and of course the flats and huge factories from the last 50 years. 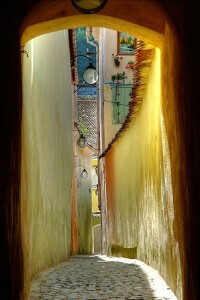 The Rope Street -the narrowest street in SE Europe- The Rope (Poarta Schei) street is the narrowest street in Europe, with a width of almost 1.3 meters. 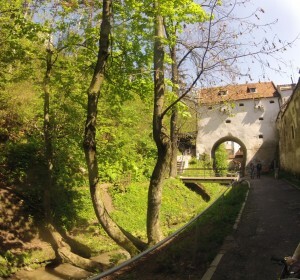 Trying to give an explanation of its size, we could say that it has been built with the purpose of creating a connection between two other streets in Brasov. In the past, this street was only a simple corridor for firemen. Be very attentive when looking for this street, because you might miss it (well, because of its size you know) and don’t forget your camera at home- you can take some great pictures here! St. Nicholas Church The church was established in 1292. It was mentioned in a Papal bull issued in 1399 by Pope Boniface IX. Starting in 1495, the church was rebuilt in stone by the locals, with help from Vlad Călugărul, Voivode (Prince) of Wallachia. More help was provided around 1512 by Neagoe Basarab. 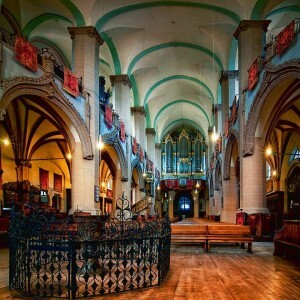 Saint Nicholas Church was initially built in the Gothic style, it was later redecorated with Baroque style architectural elements. The interior has frescoes painted by the renowned muralist Mișu Popp. Special tip: This is an orthodox church, Romanian main religion. Did you that Romanians are the only orthodox latins ? The First Romanian School Hidden in the gardens of one of the oldest churches in Brasov, the First Romanian School museum hosts an important exposition regarding the history of typography (old manuscripts, pages from the first books ever printed and others). 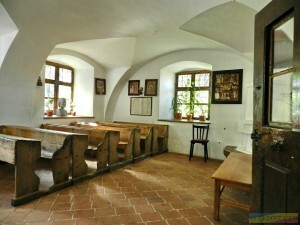 In this very old and traditional building you will find the classroom of the first school of Transylvania. You have the opportunity to sit in the benches where the big names of Romanian culture have sat and learned to write their first letters under the guidance of their teachers. Lose yourself in this small, but big on stories museum. Special tips: Inside of the museum you can find some of the worlds rarest books! 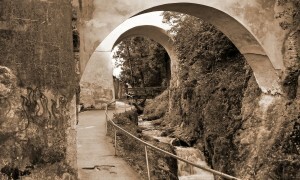 Behind the Walls Alley In the 14th century the Graft ditch was built as the first obstacle against attackers. 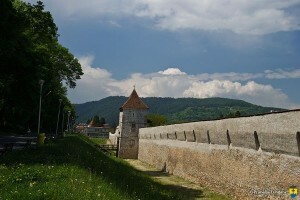 Afterwards, the first defending wall of Brasov was built, surrounded by 8 towers and bastions. Nowadays, this is a very quiet and relaxing place to have a walk in the nature, see the ancient walls of the old city and feel protected by the big and powerful towers. There are a lot of places where to walk here, from the forest to surprising spots where you can observe the whole old city from above. Special tips: Don’t be afraid to “get lost” on the trails in the forest, form here you can visit the Black and the White Tower and you will also have a nice view over the city! Seven Stairs Canyon The trip to the 7 Stairs Canyon can be done in one day and it’s a remarkable experience for brave tourists. 7 Stairs Canyon lies in Piatra Mare Mountains and it is one of the great attractions in Brasov for those who enjoy hiking . The road to the canyon (and back) can be done in about two hours and it is accessible to children. The tricky part is to cross this canyon. That I wouldn’t recommend to children. Thousands of tourists transit this area but, personally, I find it quite dangerous. 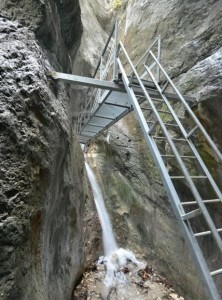 With every ladder climbed, if you are not used with climbing mountains, you will have a few mini heart-attacks. Or at least I did. As you will see in the images below, the circuit on the rocks is really not according to safety regulations. The stairs are really close to the waterfalls so in hot days it is very refreshing to climb the stairs with water splashing on you. However, tourists must be careful. The water from the waterfalls can make the steps a little bit slippery and it is very important to hold on really tight when climbing. 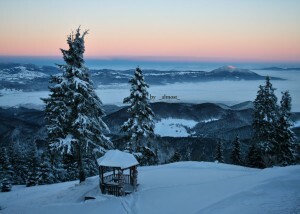 BRASOV GLADE(POIANA BRASOV) Recently improved (new runs, new cable car facilities, artificial snow), Poiana Brasov is now by far the best ski resort in Romania. Even though, compared to resorts from the Alps, is times smaller in size, you can still have the same amount of fun. Plus, the ski school here (Ana Ski School), with its 100+ certified instructors, was voted as “Best Ski School” in the world, by the tour operator Nielsen . 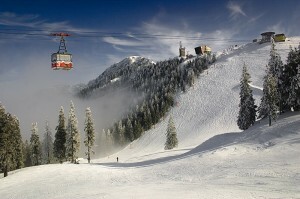 Poiana Brasov is perfect for beginner/intermediate skiers, but it also offers fun for off-piste maniacs. European Youth Olympic Festival will be held here in February, 2013. Poiana is not attractive only in Winter time, but throughout the year, offering opportunities for trekking, mountainbiking, paragliding etc. 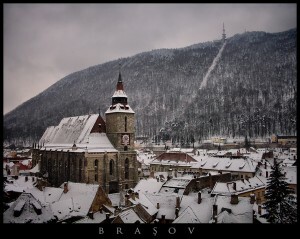 Where and how can I have fun in Brasov?! Do you like to party of just have a drink? The city is full of bars, restaurants and pubs (especially in the old town area). In Brasov you can have also a good nightlife in one of it’s clubs. Or do you want to vistit the surroundings? Every morning on 10 o’clock there is a free walking tour starting from the Council Square ( the main square). 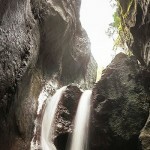 Or you can book a trip to Bran, Sinaia (Peles Castel), Transfagarasan, bear reservation etc. Are you the “adventure guy”? You can also try push your limits in “Aventura Park” of maybe push your brains to get out from the “Escaping Rooms Brasov”. For any other information don’t hesitate to ask the reception. Special tips: You have to! You really have to try Romanian gastronomy. Our food is simply… delicious !